The word on this device is that it was an early scientific instrument-band, used for controlling moonlight wavelength emulations. This explains the arcane runes and clockwork mechanisms etched gracefully across the entire band. Of course, I don't believe in that kind of silliness. I mean, the man on the moon would never allow you to control the wavelength emulations coming from his home. Regardless of its purpose, this is an absolutely astonishing piece of artwork. Wearable by both men and women, this bracer features highly stylized mechanisms and cryptic symbols etched deftly upon its surface by the master jewelry makers at Alchemy Gothic in England. The etchings include a mysterious clockwork wheel, Fleur-de-Lys style patterns and enigmatic Da Vinci style scribblings. 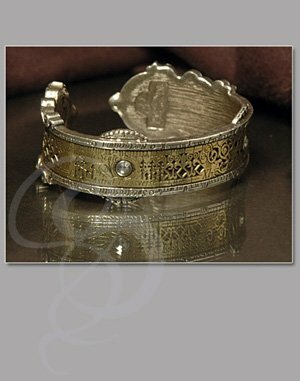 The edges of the band support waving fronds of pewter, traveling fluidly around the entire length of the bracer. 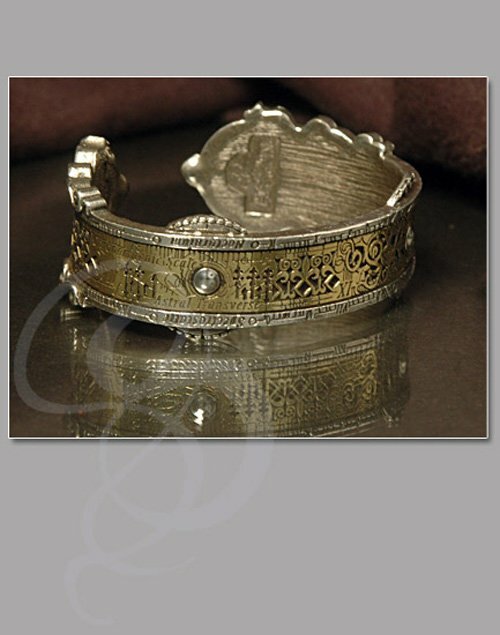 This is a truly unique and handsome item, made from the finest pewter and brass and designed flawlessly. It makes a great sensation -- wherever you wear it. 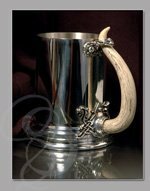 Materials: Made from high quality pewter and solid brass.